HomeBlogBackpacksHow heavy is your normal hiking pack? Complete guide to appropriate weight for backpacks for hiking or mountain climbing? How heavy is your normal hiking pack? Complete guide to appropriate weight for backpacks for hiking or mountain climbing? People need backpacks to get all their stuff at one place so that it gets easy to carry and is protected. Moreover, if you carry all your stuff in your hands, it will feel heavier than if the stuff is kept in the bag and the bag is held by the shoulders. The second need is for the bag to be light so that it can be carried easily. If the bag is heavy itself, it will become even heavier when things will be placed in the bag.Hikers need light bags more than anyone else, because they need to walk long distances and if there is heavy weight on their shoulders, they will be facing much difficulties. While hiking, a person’s backpack should not weigh more than 10 percent of his/her own weight. If it is more than that, it would result in back sprains or injuries. However, this percentage statistic is an estimate and real situations may vary. If two people have the same weight but their physique is different: one is fat while the other is muscular. So, the muscular guy might be able to carry heavier loads than the fat guy. However, in any case, lighter backpacks are always preferred, because lighter the weight you are carrying, more the enjoyment you receive. So, there are many such light weight bags that are suitable for hiking at Gizmoist.com. One of them is the Cycling Backpack with Solar USB Charging. 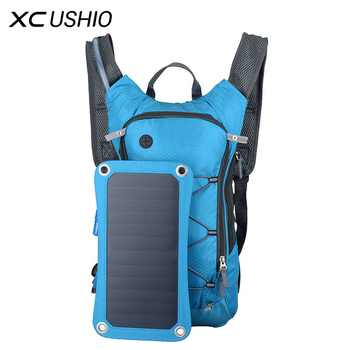 Although the backpack is named as ‘cycling backpack’, it is extremely suitable for hiking because of the design it has and the features it offers. It has a solar panel, so you do not have to worry about carrying a power bank which would have even increased the weight of your luggage. Moreover, it has an external USB port to charge your phone while hiking. The bag also has a water bag with it with a capacity of 2 liters to help the hikers stay hydrated. Adding to this, it is quite spacious with 15 liters of capacity. It is made with a comfortable material and weighs just 728 grams when empty. This is one of the best light weight bags for hiking with all the necessary features. Another great light weight backpack for hiking is the Laptop Backpack with USB Charging which weighs 1.63 pounds when empty. This bag offers an external USB port too. The bag is made up of the 300D Oxford fabric and is waterproof. Moreover, it is available in several colors, has anti-theft features and comes with a free USB cord to charge your phones. New Oxford Swiss 17-inch Waterproof Travel Rucksack is another light weight backpack suitable for hiking. This bag too has an external USB port to charge phones while hiking. It has 6 exterior pockets and several interior pockets to keep your stuff organized as you need it. Moreover, the bag is waterproof and wear resistant, and is available in 8 different colors. Color Backpack with Floral Prints is another great light weight backpack suitable for hiking, but it is targeted to be for women because of its design. This bag too has an external USB port, is waterproof and is quite spacious. Made from 100% polyester, the bag is available in two colors: red and blue and two distinct sizes: big and small. A heavy backpack can ruin your entire trip. A hike that you planned to take for pleasure and to take your mind off all the stress, will turn into an irksome journey to complete. So, you must never choose a heavy backpack for hiking just because it is stylish and/or cheap, because you can get lightweight stylish backpacks, perfect for hiking at reasonable prices at Gizmoist.com. Moreover, there are constant sales on the website so you must keep on checking and order right away when there is a sale to save even more money. What should the most basic hiking backpack contain and for how many days/weeks could you hike for? What would be the best hiking backpack for women?